Program director Henryce Jackson-Gumes posed in a room at New Joelyn’s Home in Boston. Nearly three years ago, a police officer burst into Joelyn’s Family Home, a drug treatment program on Boston Harbor’s Long Island, and told the women they had to leave immediately. Some, in recovery from previous traumas and addictions, feared there had been a terrorist attack. Others left so quickly they didn’t pack medications, vital documents, or even underwear. Now, the residential program — the last Long Island treatment facility to reopen since the city abruptly condemned the dilapidated bridge connecting the island to the mainland in 2014 — has finally found a new home, a painstakingly restored, century-old Victorian in Roxbury. “If it takes a village to raise a child, sometimes I felt as though it took the entire Commonwealth to build this home,” said Jonathan Scott, executive director of Victory Programs, a Boston nonprofit that runs Joelyn’s and other recovery programs. The new program, which opens Thursday,cost $3 million to relocate, a price being split equally by the city, state, and private donors. When Long Island closed, the city lost 742 beds for the homeless and 225 beds for those in recovery programs. All of those have now been restored. But the region’s opioid crisis has only increased the demand for such long-term services. “The need for more treatment beds . . . throughout the state is paramount,” Scott said. Nearly 2,000 people in Massachusetts are believed to have died from opioid overdoses last year. Nearly every recovery home in the state has a waiting list. “I guarantee you every one of our 24 beds will be filled the day we officially open,” said Scott, whose staff noted that Victory Programs isn’t losing any beds. They have placed additional women at the group’s other homes in the area, he said. City officials said they are mulling whether it makes sense to rebuild the Long Island Bridge, which would cost an estimated $80 million and take up to three years. In the meantime, they have set aside $28 million over the next five years for the project. Since the city spent $17 million to raze the bridge in 2015, access to the island has been limited to boats. The island could also be used for other purposes, he said. But if the city does rebuild the bridge, he would like to see substance-abuse programs reoccupy the vacant buildings and other land, which the city is spending $1.6 million a year to maintain. “It could be a great place for residential treatment programs,” he said. An old tuberculosis ward, Long Island is isolated and provided a respite for those struggling with drug addiction. They lived far from their pushers and other dangerous temptations, an isolation that, along with the serene views, aided in people’s recoveries. 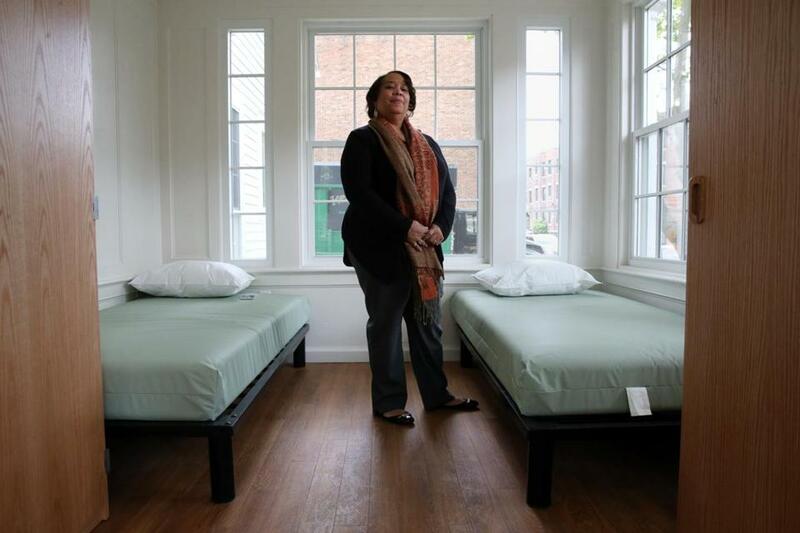 Officials at New Joelyn’s, where every room is freshly painted and filled with new, custom-built furniture, are aware of the challenges facing their new residents in Roxbury, where liquor stores, heroin, and other drugs are available a short walk away. There are also security concerns. The program is installing locks on bedroom windows and alarms on the back doors. “Safety is a big issue,” said Eileen Maguire, a deputy director at Victory Programs and a former director of Joelyn’s. But the location offers many benefits as well, they say. It’s closer to medical services. It’s much easier for women who work to get to their jobs. And it allows residents to put their sobriety to the test of the real world. “Our residents have to learn how to cope when they see a drug deal, and how to say no,” Maguire said. Nikki Sheldon, who was serving as the director of Joelyn’s when it was closed, was surprised how long it took for the program to reopen. “It’s very upsetting,” she said. She’ll never forget the stress of shepherding about 35 women off the island and struggling to keep everyone together and safe. “I was fearful, angry, and hurt,” she said. But when she first walked into Joelyn’s new 6,500-square-foot home, complete with a grand, spiral staircase, an ample, newly manicured yard, and gleaming sitting rooms with their original stained glass windows, her eyes welled up. Kelly Rapoza knows well the pressures that Joelyn’s new residents will soon confront, and how fortunate they are to get a bed. “You’re literally fighting for your life to get into one of these places,” she said. Among the women living at Joelyn’s when it closed, Rapoza was transferred to other residential treatment homes before being reunited with her young son. They now live together on their own in Jamaica Plain. On a recent visit to the new house, which a year ago was boarded up, covered with graffiti, and filled with cobwebs, she couldn’t contain her joy.